They still have not returned our calls or emails. But they have spoken to press, and say that their side of the story has two key elements. First, that none of this was a surprise and we knew they were likely to break ties with us. And second that TechCrunch hasn’t done anything to help build the CrunchPad and therefore has no rights to the device. Both statements are completely untrue. Among other things, emails from Fusion Garage illustrate it. We aren’t going to restate every detail of the story here, mostly because it’s not all that interesting. But I will give a few highlights. And I’ve embedded letters sent from our law firm below to Fusion Garage as well as the ODM manufacturer, Pegatron. There are lots more details included in those letters. There is just no way to argue that TechCrunch is not the joint owner of all intellectual property of the CrunchPad, and outright owner of the CrunchPad trademark. The CEO of Fusion Garage has spent nearly six months this year working from Silicon Valley and our offices. Most of the Fusion Garage team has spent the last three months here working with our team on the project. And our key team members have spent time in Singapore working directly on the hardware and software that powers the device. Fusion Garage emails and their own blog, before it was deleted, acknowledge this. We have also spent considerable amounts of money creating the device, paying the vendor and other bills that Fusion Garage wasn’t able to. There is quite simply no way we will allow this company to move forward on this project. The extent of their fraud is only now becoming clear to me. The audacity of their scheme is staggering. We believe that they engaged with us until the last possible moment to get press attention and access to our development resources and cash, and then walk away hoping that we’d do nothing. Here are the letters sent by our lawyers both to Fusion Garage and Pegatron (who, it turns out, terminated their agreement with Fusion Garage in August, although Fusion Garage never told us and continued to pretend they were working together). 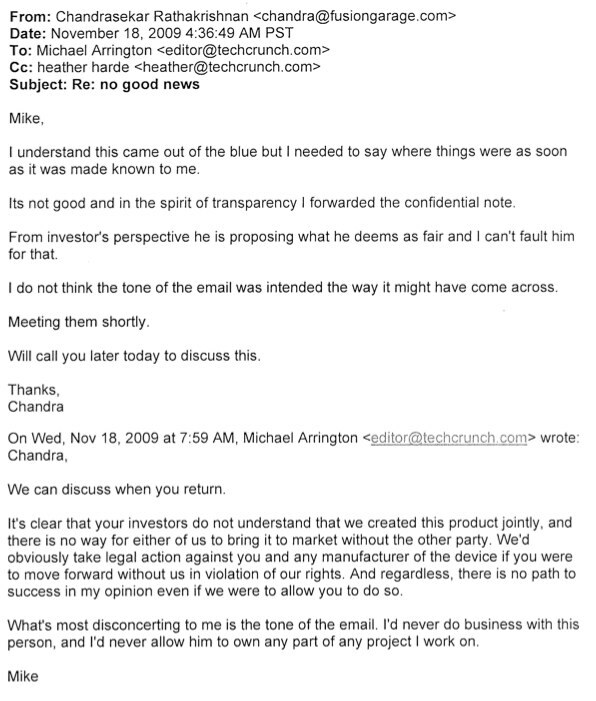 We’ll likely move further updates on the lawsuits to our CrunchNotes blog.